The Good, The Bad and the Brioche! 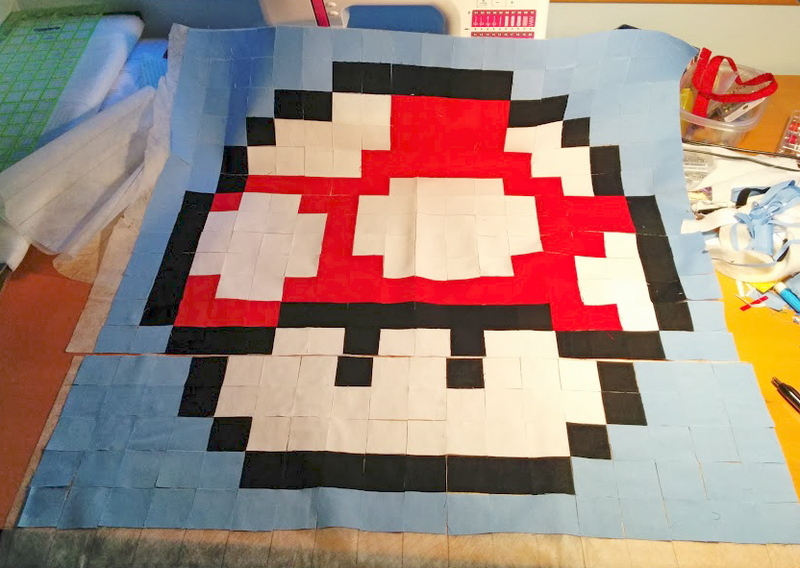 Thus far this month, I’ve tackled a few smaller quilting projects. One of which started out as a simple conversion of a bedskirt into a set of valances for Dale (of the Sunflower Dresden quilt fame). But then I had fabric left, and if you do any kind of scrappy quilting that you can’t let so much as a perfectly good 2 inches of fabric go to waste, let alone any amount larger than that! So I made a normal pillow case, trimmed in “valance plaid” and then I had more fabric so I made a few quilt block decorative pillows too. 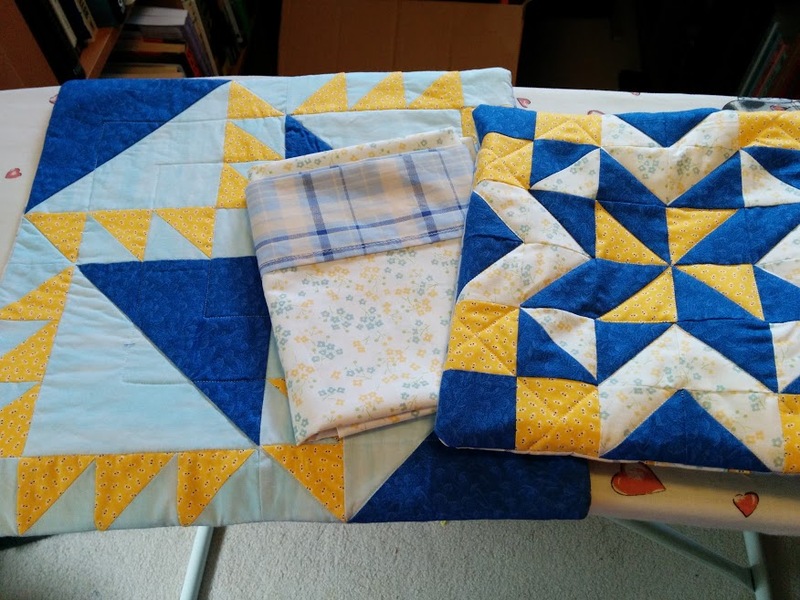 The blue and yellow floral is new, but the dark blue and yellow are scraps from her sunflower quilt, the light blue from my first quilt. Both smaller pillows are backed in her “valance plaid” to help tie the whole ensemble together. The inside pillow forms were made from some of the plain white that was a part of the bedskirt. So all told I bought a yard of fabric, and ended up with 3 pillows, 3 valances and I still have a smidgen left. 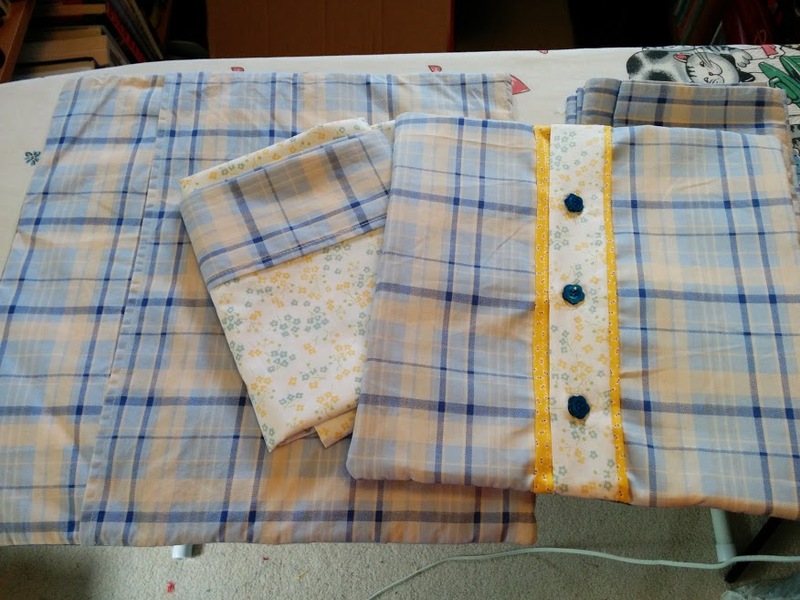 Smaller pillow features my first ever button holes on my sewing machine too! Here’s a photo while I was waiting for the adhesive to dry. You can see where I will need to seam the two sections together. Like most of my quilt projects, I tend to take several cell phone photos of it as a work in progress and post them in an album. Which you can check out here. Wish me luck! I might just need it. 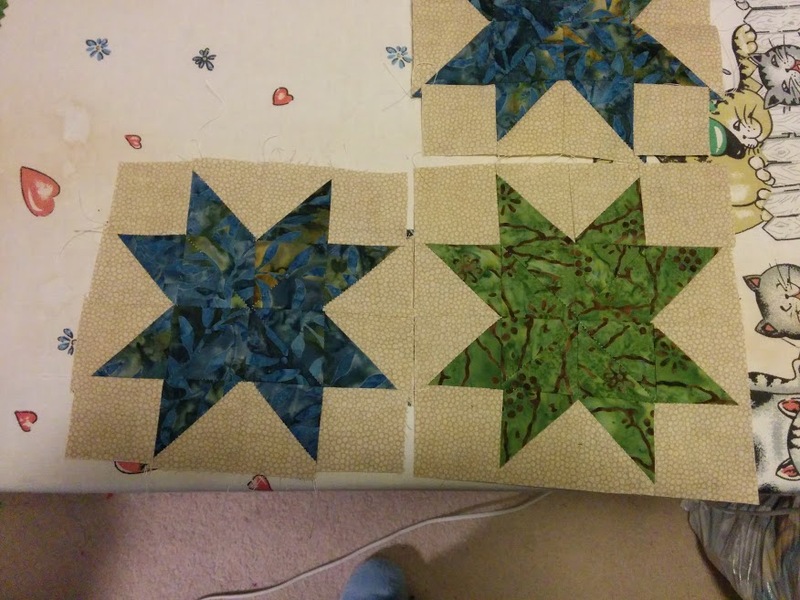 In other mixed good/bad news, I did forge ahead with three more stars on my giant star quilt. I am not super thrilled with how some of the points came out, and was feeling kinda crummy about it. I do think the later pillow project actually helped, as it has similar cuts and came together very well. A while back I fell in love with a certain pattern for a shawl on Ravelry that uses Brioche stitch. So this year I told myself I was going to learn. 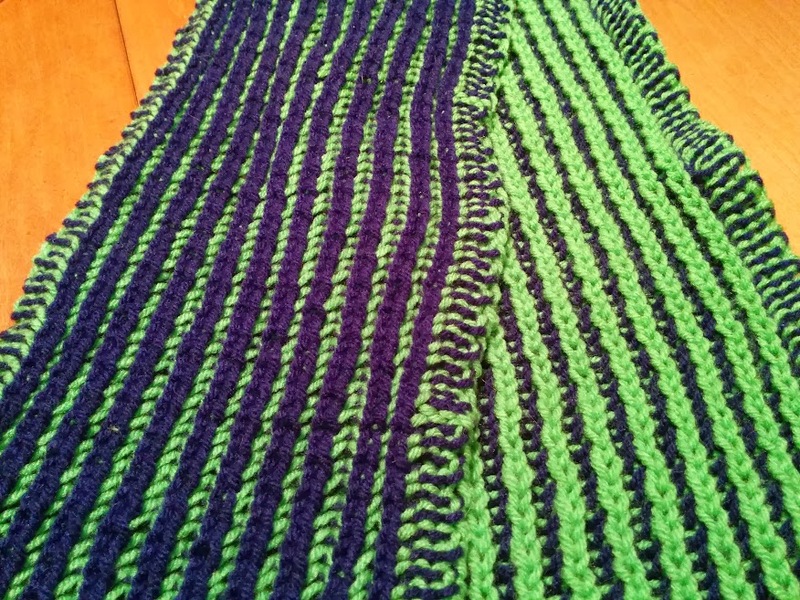 And with the help of some left over Seahawk Action Green, I started with a nice beginner brioche scarf. Brioche doesn’t look like it has a wrong side. Just a side of a different color. 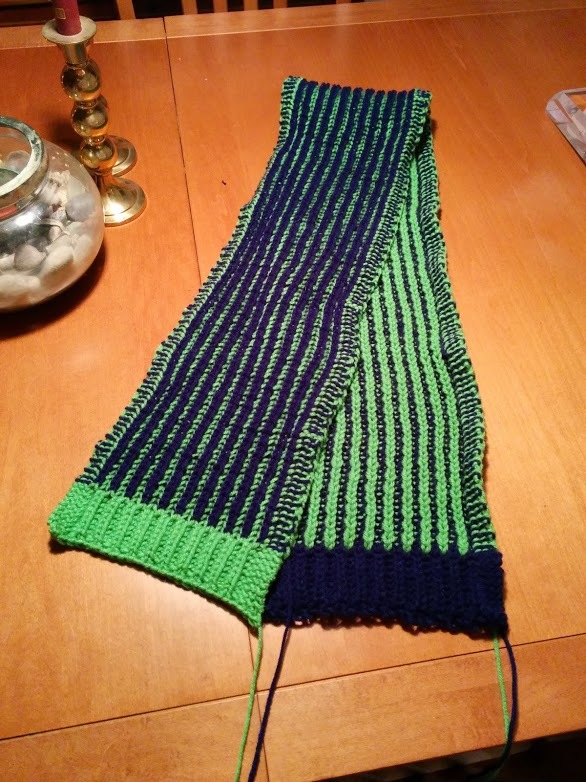 And so just before the Seahawks finished up with the 49ers, I finished up with my Brioche Scarf! The tails are done in single color. Now I just need to find the yarn I want for the shawl project and I’m all set. I’m looking for a spring green for one color and autumn spice for the other.